The place is small yet comfortable, and the large deck view is incredible, with a private feeling. We had a car, but one could walk about 20 min to lovely Bianco beach and Padulella, and then walk into the town. There is also a pebbly beach down below the villa with a good exercise walk back. My favorite sandy beach on the island was at Biodola, and Laconella was also very sweet. Owners were very nice. Amazing property, stunning views, lovely hosts. Our trip started with our hosts parents coming to the port to pick us up to take us to the apartment, they were so sweet and helpful - taking us to a local supermarket so we could cook dinner in the apartment on our first night. The apartment is decorated simply, and has everything you need, a comfy bed, all the facilities you would need, and the view - is the most stunning view we had in Italy, you have a giant balcony all to yourself with a table and views of the coast line and surrounding hills. The 2 minute walk to the secluded and empty beach was the icing on the cake. We wish we could go back! Lovely hosts (Ellisa parents) who gave us so much help, maps, told us all the secrets of the island, and we were 100% happy with everything, we will come back one day! Thank you so much!! Very nice and polite guests, I hope you come back soon. Die Ferienwohnung liegt an exponierter Lage mit Traumblick auf das Mittelmeer. Wohnung ist für 2 Personen Klasse. Alles sauber. Sehr zu empfehlen. Der Seccionestrand ist sehr schön, wenig überlaufen und mit 250 Treppen hat man gleich das tägliche Fitnessprogramm absolviert. Wir hatten einen tollen Urlaub bei Elisa. Danke. Spero di ospitarvi di nuovo all'Isola d'Elba. Bellissimo bilocale. Ordinato e pulito con grande terrazza sul mare. Adatto per una famiglia di 4 persone. In posizione strategica anche se l'isola d'Elba è strategicamente favolosa. My husband and I stayed here for two weeks in June and loved every minute of our stay. the apartment is amazing. The photos don't do it justice. The view from the huge terras is nothing less than spectacular. We didn't go out for dinner often because having dinner on the terras was so much fun. The apartment has everything you need. Fully equipped kitchen, shower, comfortable bed, washing machine. There is a very quiet and pretty beach just a stairway from the apartment. Great for snorkeling or a lazy afternoon.in the sun. Communication with Elisa prior to and during our trip was great. We were greeted at the apartment by Christina, and although we didn't speak eachother's language she managed to make us feel very welcome and tell us all we needed to know about the apartment. Elisa sent us an email with some great tips about things to do on the island. 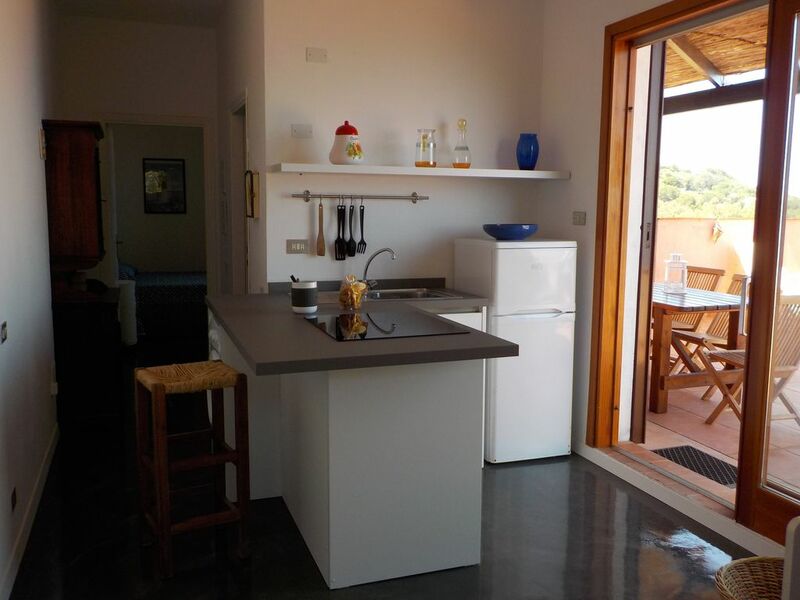 Elba is a beautiful island and this apartment is a perfect place to stay. I would recommend it to anyone and certainly hope to stay there again soon. Casa che mantiene ciò che promette. In particolare la terrazza vista mare, con la possibilità di cucinare fuori, è stata graditissima. Si potrebbe valorizzare ulteriormente con un bel BBQ. Ottima la posizione: la spiaggia del Seccione (non eccezionale, ma carina) è raggiungibile in 5' a piedi; spiagge splendide (Sorgente, Sansone, Sottobomba) a 5' di macchina.